BlacKkKlansman, Spike Lee’s provocative and powerful new joint, finds the director at the top of his game. The movie serves as the rare, late period return to form for Spike Lee. And aside from being hard-hitting, insightful and timely, it is his most accessible, entertaining and narratively rewarding movie in a long time. It’s hard to say what exactly reinvigorated Lee but he has recaptured the lightning that made him such an important and incisive director in the first place. And the movie, a genuine crowd-pleaser, also serves as a star vehicle for John David Washington who absolutely owns the screen and shows that talent seems to run in the family. (He is Denzel Washington’s son.) The movie is based on a true story that proves the maxim that truth is stranger than fiction. Washington plays Ron Stallworth, the first African-American police officer in Colorado Springs. Initially consigned to the records room, Ron is stuck fetching files for other officers and while there he encounters the racism he was warned about before being given the job. And it doesn’t take long for him to feel as if his skills could be better used somewhere else. However, his pleas to be transferred to an undercover division are, initially, turned down by his commanding officer. But this soon changes when they find out that a former Black Panther Kwame Ture, (Corey Hawkins) formerly known as Stokely Carmichael, will be in town to speak at an event organized by the black student union at a local college. Ron’s boss decides that he could be a useful tool to infiltrate the rally and gather information so they can assess the “threat” that Kame Ture represents. At first it seems like the assignment was meant to be a one-off, but that soon changes when Ron spots an ad in a local newspaper, casually recruiting new members for the KKK or “the organization.” Seemingly, on a whim, Ron calls the number asking for information and that’s where things really kick off. Ron pretends to be a white man interested in joining the Klan by explaining how much he hates pretty much anyone who doesn’t have “pure white Aryan blood running through their veins.” Surprisingly that’s about as much as it takes for the Klansman on the other line to decide Ron would be a good addition and the two set up a meeting. But for obvious reasons, Ron can’t actually go there in person and so he decides that he needs a stand in for him. The responsibility falls on Flip Zimmerman. (Adam Driver) Although his plan is predictably met with skepticism, Ron convinces his commanding officer that with the “right white man, you can do anything.” And together, the small team goes about infiltrating the KKK. What follows is a master class in building cinematic tension. As both Rons continue to go further into their investigations, they have to deal with escalating problems that come with leading double lives and there are more than a couple of close calls. But the movie also provides more than its share of laughs. Topher Grace portrays David Duke as a clumsy dimwit, and serves as one of the movie’s funniest highlights. Lee, who co-wrote this film with Charlie Wachtel, David Rabinowitz, and Kevin Willmott, based on Stallworth's memoir "Black Klansman," has always been clear about his messages and he’s no different here. But unlike some of his previous efforts, this movie is nuanced and feels all the more powerful because of that. The movie takes place at a time when the progress made by the civil rights movement was met with a fierce backlash by those who would see someone’s efforts to achieve basic equality as a personal attack. But it mirrors our own times in which the so called “Alt-Right” (white supremacists) are seething and desperate to undo the progress of the Obama administration. It makes you wonder if the cycle of hate can ever truly be broken. Although, the movie isn’t always subtle, it is a Spike Lee joint after all, it isn’t lacking nuance. In fact, some of its best moments are also its quieter, more intimate scenes. Ron and Patrice (Laura Harrier) have, sometimes, pointed, but always meaningful conversations. In questioning and trying to understand each other’s beliefs, they also ask one another and by extension, the audience important questions. Although these are questions that Lee has been asking throughout his career, somehow it feels different and fresh here. It could be a mixture of things coming together that gives the movie its relevance and elevates it. The fact is that the movie really is that good, the performances really are that powerful and the questions are that important. And perhaps more importantly, or tragically, those questions more relevant than they have ever been. At times the movie seems to be suffering from a sort of identity crisis as it veers from a blaxploitation spoof to a thrilling undercover movie and ultimately ends with a ripped from the headlines urgency that is bound to leave viewers with a lot of feelings to work through and talk about. But the mixing of tones is intentional and used to great effect. Make no mistake, Lee in complete control of his craft, has made a movie that is thrilling, funny, sometimes brilliant, and even heartbreaking. A big part of the reason why the movie works so well is because of the great performances. Washington, as Ron, has charisma to spare and he absolutely shines in the role. It’s a difficult role and it’s not hard to imagine that in lesser hands, Washington’s character could have gotten lost in the mix. It certainly wouldn’t be the first time that a great movie overshadows the protagonist. But Washington gives Ron a depth through his performance that perhaps wouldn’t have come through simply from the way the character is written. Washington has a calm, self-assured charm that manages to hint at the character’s complexities. And Adam Driver, who has quickly proven to be one of the best actors of his generation shines as the conflicted Jewish Police officer tasked with infiltrating the KKK in person. Identity is clearly a big part of this movie and Driver’s stellar performance helps highlight another aspect of that. His character’s conflict shines an unexpected light on the Jewish American identity. Flip, pretending to be Ron, is the one who actually has to go to the KKK meetings. He is the one who is literally putting his life on the line. And he is angry that Ron treats this investigation as a crusade, claiming that for him “it’s a job.” However, Ron calls him out, reminding him, that as a Jewish man, Flip has just as much “skin in the game.” Because of this, Flip is forced to realize that, perhaps unintentionally, he has been “passing” for WASP all his life. It’s not that he meant to or that he was ashamed of being Jewish, but he explains that he always thought of himself as “just another white kid.” So, when Flip rejects the KKK membership card they have been waiting for, softly stating that he doesn’t want it, the emotional conflict is etched into his face. It’s not hard to imagine that another actor might have taken a more cliché approach and imbued that scene with a flashy and over the top indignation. But instead Driver went for a subtle approach that shows the emotional toll the character is facing. Although the movie is not made specifically for anyone but, rather for everyone, it’s not hard to imagine that it might mean different things to different viewers. As a person of color, it’s a powerful, affirming movie that reminds us that there is, not only, nothing wrong with being dark skinned but there’s beauty in it. 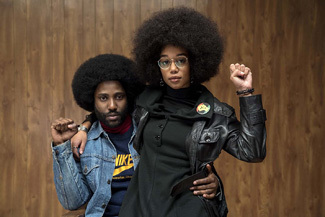 Spike Lee’s movies have the tendency to veer into “preachy” territory and BlacKkKlansman is no different but it’s done so well that it winds up being one of the movie’s biggest strengths. There are times when it feels like the movie is actually speaking directly to you and it is a beautiful testament that highlights the power of the medium. The scene when Kwame Ture is speaking at a rally for the black student union serves as a moment of emerging political awareness for Ron. But it also doubles as a speech to the audience itself. By bringing up his childhood love of Tarzan, Kwame Ture manages to point out how, as a society, we are taught to equate beauty with whiteness. And this might be one of the places where audiences might be divided. For some people, this could be seen as a bit on the nose. As Kwame Ture speaks the movie cuts to the students’ faces surrounded by halos of lights. To some, this might seem like it’s lacking subtlety but for some of us, it’s a beautiful, powerful moment. It articulates the complicated, internal struggles that we, as people of color, have to navigate every day of our lives. Our society is such an inherently white patriarchy that reminds us every step of the way of our supposed “otherness” that it becomes ingrained within us. We see ourselves as less and often struggle against ourselves. Even the popularly used phrase “person of color” lumps together countless of diverse groups of people based on the simple fact that our skin is dark. It reduces us and defines us all by our skin color as if that’s the only thing that matters. But in doing so, it also propagates the idea that white skin is somehow the “default” or “normal” state. There have been times in so many of our lives that we looked in the mirror and hated what we see. We harbor a self-loathing that for many of us is hard to ever fully erase or overcome. And the movie reminds us of the fact that there are people who hate us and perhaps will always hate us, simply for the color of our skin. It’s an overwhelming and hurtful thing to have to deal with. In one scene a character and his wife talk about the prospect of killing people of color with an unrestrained giddy enthusiasm. The movie plays the scene with an almost cute energy that it might lead you to think that they were finally getting to go on a vacation they had been planning for years. It’s done so well that you can’t help but laugh but immediately feel uncomfortable afterwards. Fortunately, the movie also reminds us that progress is worth fighting for, even if it’s slow to come, even if there are people who fight it every step of the way. It also shows us that for all of the racist, hateful people, there are also those who truly, genuinely care. There are people who put their time and lives on the line even if they don’t stand to personally benefit from the struggle. The powerful coda links the movie directly to our present by cutting to footage of last year’s events in Charlottesville, Virginia. And by ending with a memorial to Heather Heyer, a white woman, who was fatally hit by a car while protesting the rally in Charlottesville, it reminds us that we are all in this together and that hate hurts us all. His self-published comic books and graphic novel have been sold in stores in NYC and online. He is the co-editor and contributor of a comic book Anthology called Emanata. That book features the work of many other talented creators from all around the country. You can check out his comic books and read more of his writing here.